Towns forums • View topic - How to paint with gimp? How to paint with gimp? Re: How to paint with gimp? Colombo wrote: I am trying to toy with gimp. Lets say, I wanna change color of those greyish stairs into that ancient wall/ancient ladder etc. (that one with mayan symbols on it). Btw. BurningPet, those other Mayan walls are great, why they aren't in game? Thanks. they were supposed to be alternate graphics for the mayan block, so that each time you built one (Or found one in the dungeon rooms) its graphic would be randomly chosen between the various options. Can't help you with gimp since i don't have much experience with it. Btw, this just reminded me of something: the gel engraved walls decoration is actually a mayan sign called "Ben"
Again, not a really necessary feature, but potentially adds a bit more "life"/personality to the townies, and it leaves the door open for modders to run with the idea. Of course, I'd much prefer to see the items being re-done to have different states and graphics etc. stored as data within the item rather than separate items... but in the meantime, if that's not a practical ideal. Oh, silly thought... could you exploit the facing directions to use the different block designs? It would be a nice bit of irony - different facings (directions) lead to different faces... But since that particular block is a full-size one, the different styles would all line up... so if the North face is one design, the South face is another etc., then it would have some of the same effect; nowhere near as random though. burningpet wrote: Btw, this just reminded me of something: the gel engraved walls decoration is actually a mayan sign called "Ben"
Burningpet: Unfortunately, the real mesoamerican art/buildings were much colorful. 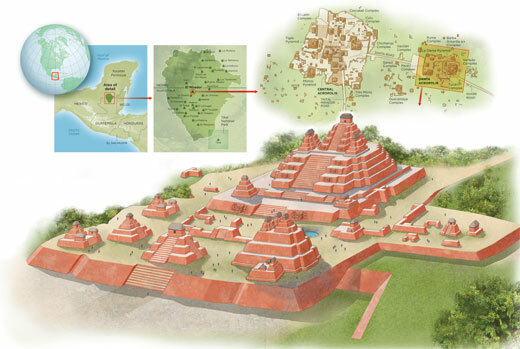 Bit of neo-maya art or some pseudo-historical reconstruction? The ones i seen are ancient so all the color went off. but i guess i could paint ones that are "new". Exactly. Both the Egyptian and Mesoamerican buildings were really colorful. There are still some parts, were color did not wen't off completely and some reconstructions, but popular depiction of such buildings even films and games from that time shows the same old bland buildings, so when one hears "maya bulding", he imagine something stone-grey. A lot of red and white (in Mexico, more white than red). Blue and green was royal colors, so it was little less used. Common buildings were thatched and were either mud huts or from some light wood, anything what was nearby, so mostly brown. However I think that commoners city-buildings were white (or red, limestone was mashed and burned to make white plaster or colored with red coloring to make red one) as they were covered with plaster. 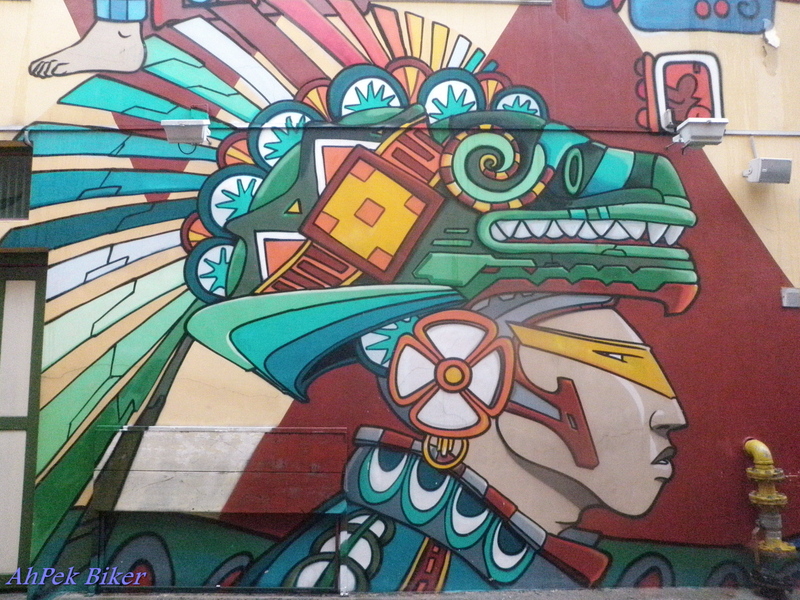 edit: And that upper image I posted isn't reconstruction, it is neo-maya art in Singapore. It would be awesome to see some "inlaid walls", Mayan walls are a prime example but also fantasy creatures (Dwarves especially) and Victorian/Gothic filigree styles would add a cool flavour. Or Greek and Roman murals or mosaics... again, it would greatly benefit from randomised graphics, but even a sub-section of "decorated walls" would add a lot of charm. It would be really great to see that being used in temples if you take another pass at the gods system - god X likes murals about ____ in their temple, god Y likes a mural about ____, god of death wants their temple to include bone walls and sarcophagi, god of wealth gets upset if you use "boring" wooden or brick walls in their temple etc. Again, the trick is to reward creativity and get people thinking... not "I have to build a big bone structure to keep the death god happy", more "hmm, how can I add bones to decorate this temple?" or "hey, if I lay these kind of blocks then it contrasts well with that mural block, so it looks pretty".